Colima is a state that has excellent physical and economic resources that can contribute to its development and immediate growth, however, there was no diagnosis that gathered the main economic vocations of the municipalities. In this sense, the University of Colima, through the School of Economics, raised the possibility of conducting a thorough investigation to determine the current status of the spatial, natural, environmental and infrastructure resources of the 10 communes of the entity, with the object of being identified in a spatial system or electronic platform, in which they can be visualized, updated and interpreted, according to the needs of the Government of the State of Colima and in particular, of the user sector, coordinated by the Ministry of Economic Development of the Government of the State of Colima. The chapter shows the methodology used for the preparation of the economic vocational study, the indicators and data, the planned goals and the objectives, as well as the problems that were faced and solved and the methodological decisions and if justification. The preparation of the study of municipal vocation of the State of Colima, as well as the technological platform to encourage and facilitate the investment decisions of the referred entity, meant two innovative inputs, which marked the positive approach between the public sector and academia, with the purpose of combining efforts and talent to generate first-hand information to be used by the public entity itself and by the private sector to reinforce knowledge of the region resources and strengths o in greater depth. The technological platform remained as a real proposal, which includes economic data collected from official statistical sources at the municipal level, as well as information obtained from the vocational study and a survey to identify the characteristics of employment and unemployment in the 10 municipalities of the entity. With this information, the interested investor in use of that technological tool has the possibility, first, of identifying the physical, economic, demographic and organizational resources of each one of the localities object of study; second, in navigating to recognize the information related to the business and business component; and third, to check human resources available to start a business. In synthesis, the development of the technological platform favors decision-makers in matters of investment and business, since it puts them at your fingertips, updated and systematized information, which will help to define with certainty, the type, the amount and the branch of production, which can encourage and obtain possible benefits, which in the short and medium term, could also be directed towards the creation of jobs and better remunerations at the local level. 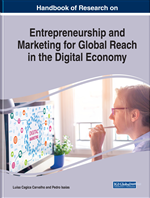 This chapter is closely linked to the title of the work, which considers aspects of entrepreneurship and global marketing in the digital economy. When carrying out the research, it was considered to know the economic vocations of the entity, through the methodology of ECLA, which includes geographic, economic, demographic and organizational resources, whose information was collected from official data from INEGI and the Government of the State of Colima, in addition to a survey on employment profile and unemployment applied in the 10 municipalities. The data obtained was incorporated into an electronic platform, in which the information for each of the municipalities is displayed, highlighting that associated with entrepreneurship, a central topic that appears in the title of the book. In the electronic platform the reader can find information related to the employed population (ENOE) with an analysis related to self-employed population, to the index of entrepreneurship, employed and unemployed female population, employed and unemployed population with basic education, with English proficiency, young, by income, prone to emigrate, willing to open a business, for their rotation at work. The statistical findings serve as a basis for investors and stakeholders who visualize the platform to identify the workforce of each municipality, as well as the characteristics of employability registered by the economically active population.